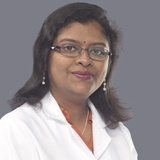 Dr Nandini Prasad has completed her MBBS from Government Medical College Kottayam, Kerala India in 2003 followed by MS (ENT) from VMKV Medical College Salem, India in 2009. Dr Nandini specializes in ENT with her special area of interest being pediatric ENT, adenotonsillectomy and Sinus Surgeries. Dr Nandini can speak English, Hindi, Urdu, Malayalam and Tamil.